Based on the facts that her brows were always on fleek and that she basically made the flower crown stylish, Frida Kahlo would’ve definitely been able to thrive in this era. And now, 50 years later, Kahlo’s wardrobe has been revealed to the world, making it clear that this artist had a such an inspirational sense of style. On display at Michael Hoppen Gallery are photos of every item that had been locked into an atypical time capsule since Kahlo’s death in 1954. Kahlo’s husband, Diego Rivera, kept all of Kahlo’s belongings in one of their home’s bathrooms. He demanded that no one open it until 15 years after his death. Rivera passed away three years after Kahlo did, but the time capsule wasn't opened until 2004, a whole 47 years after Rivera’s death. When the time capsule was opened, photographer, Ishiuchi Miyako was permitted to take photos of all of Kahlo’s belongings. Some of her things included her prosthetic leg, which uniquely looked like a lace up boot, her paint-splattered booties, and even bottles of Revlon nail polish. In 2012, all her items were put on display in her home in Mexico City, but it wasn’t until recently when all of Miyako’s photos were put on display in London’s Michael Hoppen Gallery. Her belongings revealed so much about the physical struggles she had gone through. She suffered from polio, which caused one of her legs to be shorter than the other. In turn, that explained why her booties had uneven heels. She also experienced a freak bus accident that ended up fracturing her left leg in 11 different places. Kahlo eventually amputated her left leg in hopes to recover from the excruciating pain, but unfortunately she never did. Nonetheless, even through all the blood, sweat, and paint, Kahlo’s friends said that the outfits she designed for herself progressively became more complex and intricate as her physical ailments worsened. Seriously, Kahlo was a #girlboss. She transformed her sadness and weaknesses into strengths through her art and clothing designs. 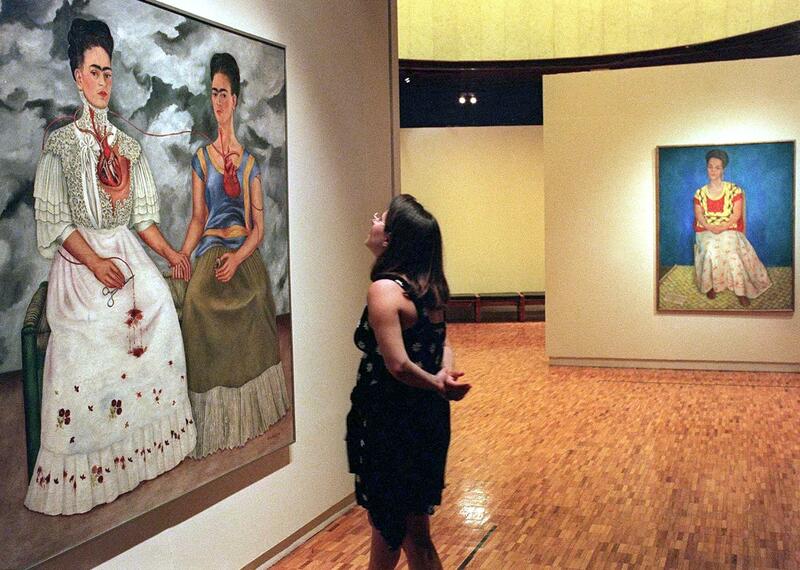 And despite her handicaps, Kahlo’s use of bold colors clearly revealed her strength amidst her hardships. I especially love how she mixed different fabrics into her dresses in order to create a beautiful, harmonious piece.